Democracy Now!. 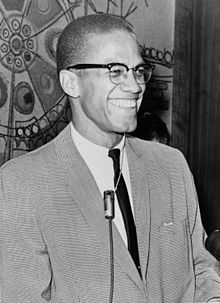 Malcolm X: Make it Plain transcript. Excerpts of the documentary, "Malcolm X: Make it Plain". Segment available via streaming Real Audio[স্থায়ীভাবে অকার্যকর সংযোগ], 128k streaming Real Video[স্থায়ীভাবে অকার্যকর সংযোগ], or via MP3 download from Archive.org. 37:23 minutes. Hosted by Amy Goodman. Broadcast May 19, 2005.